One of the questions that I get asked most often is about what to wear to a family photo session. It's a special time with your family that will be documented and treasured, not just by your friends and family, but also by the generations that come after you. I totally understand why this is such a big question mark in so many people's minds. Mothers often ground the photos, so moms, begin building your family's wardrobe for the session around an outfit that you love. Flowy dresses look beautiful on camera because of their movement. But if you're more of a jeans kind of woman, go for it! You be you. Pairing patterns is an art, which, if done too much, can quickly make a photo look busy. That’s why I suggest having only one family member in a patterned outfit. For example, you’ll want to avoid stripes with plaid, or having two family members in checked prints. Instead, stick with solids and then add texture afterward (see below). If you do choose to mix patterns, make sure that they complement each other. A larger floral with a subtle polka dot, for example, works just fine as long as the colors coordinate. 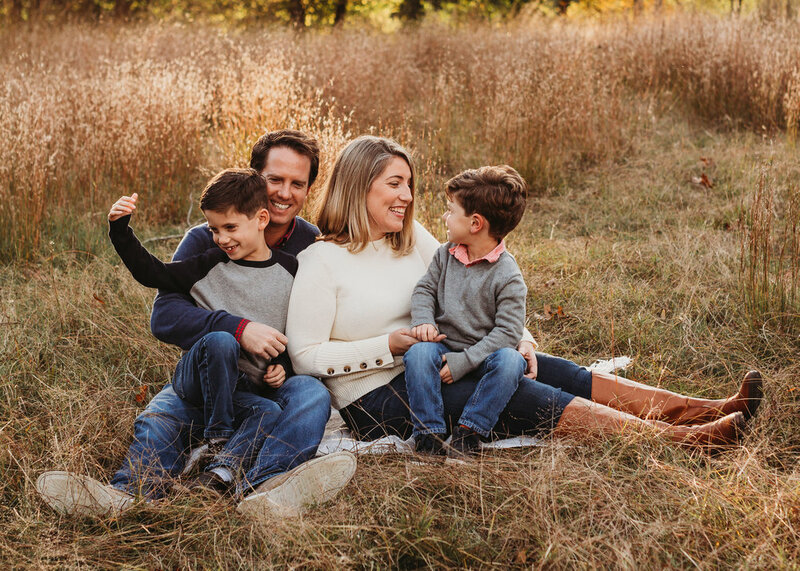 One of the goals of my family sessions is to show off each family member's individual personalities, so I always suggest that your outfits coordinate but not match. Start by choosing a color palette. Will you go with soft, romantic neutrals? Jewel tones? Black, white, and denim? Start there and then choose outfits that fall within the palette but aren't identical. Need some inspiration? Check out my Pinterest board! Remember that your photos will be treasured for decades, so aim for timelessness. 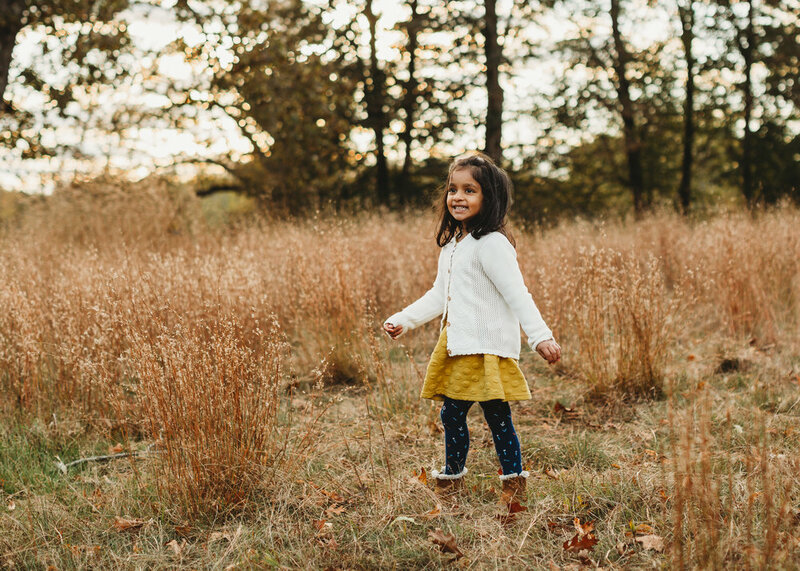 Your kids may love Hello Kitty or Nike with a passion, but for your family session it's best to stick with solids, simple patterns, or sweet florals. Bright colors like fluorescents can reflect onto the skin, so leave those out as well. Instead, I recommend opting for neutrals, like creams and navy blue, or jewel tones like burgundy, plum, or emerald green in the fall. Pastels in the spring are a beautiful complement to the springtime flowers! While simple outfits look great in real life, it's best to add some texture in order to bring personality into your family photos. Jersey knit and smooth cotton fabrics can also show a number of sins like underwear lines and fur. Accessories like scarves, hats, earrings, vests, necklaces, bow ties, and hats help to add visual interest. During your session, you'll be moving around quite a bit--standing, sitting, lying down, and even walking, dancing, and playing! As you're choosing your clothes, comfort should take priority. Ask yourself: can you sit on the ground? Can you lift your child up? As you choose your child's clothes: can they run around easily? Dance? Twirl? If the answer to all of these questions is yes, you might have a winner! Still have questions? Just ask! I’m always happy to give feedback about what will look great on camera.